Mercedes and their in-house hot rod shop, AMG, have announced a run of special edition models. In this case there are three of them: The AMG GT C Roadster Edition 50, the Mercedes-AMG C63 Cabriolet Ocean Blue Edition, and the AMG Performance Studio Package for the Mercedes-AMG C43, Coupe and Cabriolet. I know, it’s kind of odd to consider, since I always think of AMG versions as already being their special editions, but no. These are actually special, special editions. First off the block is the AMG GT C Roadster Edition 50, which gets a special equipment package. The AMG Roadster is a special version of the AMG Coupe, which is both a very competent car and rather attractive, a rare thing to say about German cars. This roadster is called “Edition 50” because, surprise, they are only making 500 cars worldwide. But only 50 of them are coming to America, so I guess that makes the name okay. Oh, and it’s also the 50th anniversary of AMG, which was founded in 1967. The GT C Roadster Edition 50 can be spotted by a special paint, designo Graphite Grey Magno. There are black chrome accents on the side skirt trim and front splitter, along with trim strips in the air intakes of the Panamericana grille. Other styling elements include the fins on the side air outlets in the front fenders; there are additional unique styling cues on the rear diffuser, along with tailpipe trim elements. There’s black chrome for days on this guy and the wheels are special too, with a cross-spoke AMG forged design featuring the aforementioned black chrome. On the inside there’s even more of that black and silver vibe. The upholstery is Silver Pearl/Black Exclusive Nappa Leather with Grey diamond-patterned contrasting topstitching. The AMG Performance steering wheel? That’s covered in black DINAMICA microfiber with Grey contrasting topstitching. The 12 o’clock mark on the steering wheel is in Silver Pearl, and there’s Edition 50 badging. The GT C Roadster Edition 50 is powered by an AMG 4.0L V8 biturbo that puts out 550 horsepower (5,750-6,750 rpm) and 502 lb-ft of torque (1,900-5,750 rpm ), which is a very broad torque curve indeed. The transmission hangs out back as a transaxle, fed by a torque tube from the AMG plant. The transaxle is a 7-speed dual-clutch transmission. The whole package can get to 60 in 3.7 seconds, topping out at an electronically limited 196 mph. 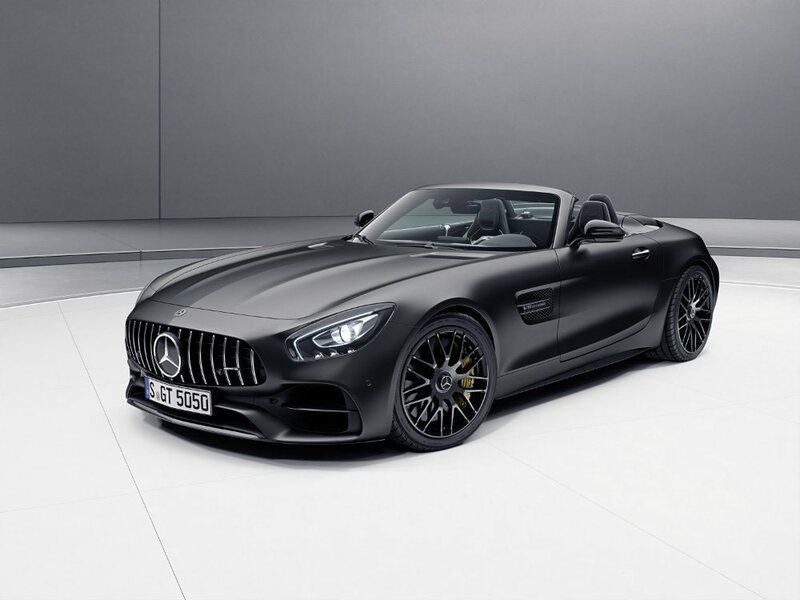 2018 Mercedes-AMG GT C Roadster “Edition 50.” Photo: Mercedes-Benz USA. 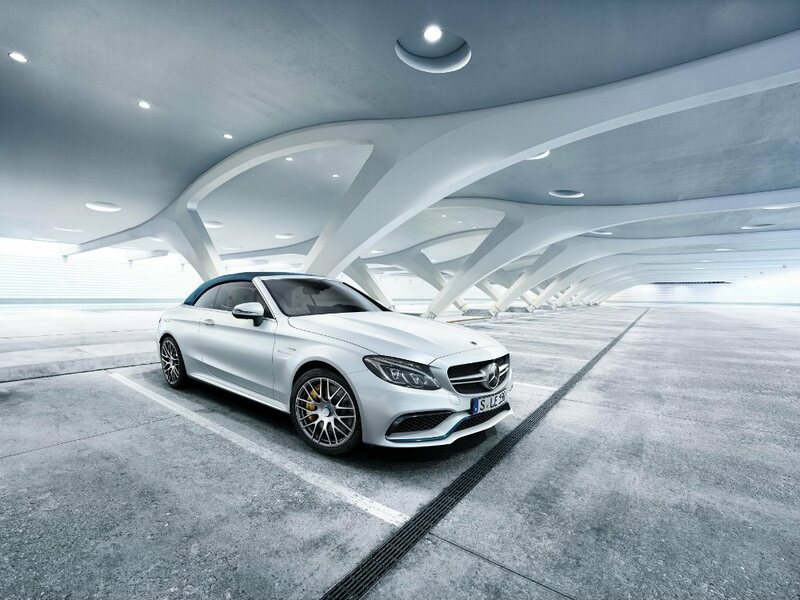 The C63 Cabriolet Ocean Blue Edition comes with its own unique styling and design. As one would imagine, there’s lots of blue, specifically, Deep Ocean Blue, which is a new color. That color is used for the fabric acoustic soft top and numerous other details such as the trim strips on the front and rear bumper, and the wheel center caps. The Deep Ocean Blue acts as a contrasting color throughout the Crystal Grey interior. The analog clock is a nice touch – it’s also highlighted by Deep Ocen Blue stitching. That does not, however, mean this cruiser can’t move. Motivated by a handcrafted AMG 4.0L V8 biturbo that cranks out 503 horsepower (5,500-6,250 rpm) and 516 lb-ft. of torque (1,750-4,500 rpm), the rear-wheel drive C63 Cabriolet Ocean Blue Edition can hit 60 in 4 seconds, topping out at an electronically limited 174 mph. The car itself is limited to just 150 units worldwide. 2018 Mercedes-AMG C63 Cabriolet Ocean Blue Edition. Photo: Mercedes-Benz USA. The third of the three AMG specials is the Performance Studio Package for the Mercedes-AMG C43 Coupe and Cabriolet. Mainly, this seems to be an over-glorified trim package with an AMG sourced mill under the hood. The car has numerous black details slathered inside and out. 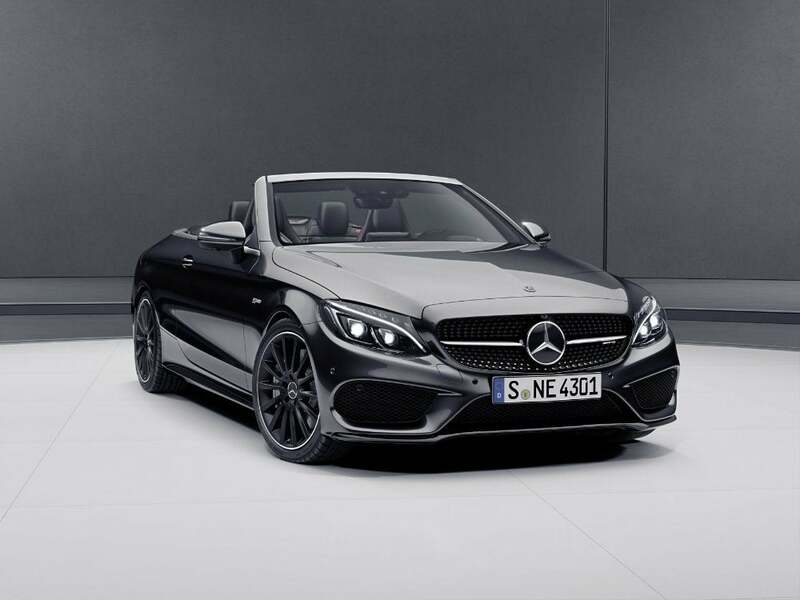 And Mercedes-AMG points out that “for the first time, the C43 Cabriolet is available with black exterior details.” I know, I, too, can barely contain my excitement. The radiator grille sports black pins instead of chrome; the trim strips on the front splitter, the rear bumper, side skirts, trunk lid spoiler, and tailpipe trim elements are all painted black. The 19-inch multi-spoke light-alloy wheels? Black. The rim of the steering wheel in nappa leather/DINAMICA microfiber is also black. 2018 Mercedes-AMG C43 Coupe with AMG Performance Studio. Photo: Mercedes-Benz USA. And yup, there’s that AMG engine up front. A 3.0L V6 biturbo putting out 362 horsepower and 384 lb-ft. of torque. This is delivered to the bahn via an AMG Performance 4MATIC all-wheel drive system (with a nice 31:69 torque split) and a 9-speed automatic transmission. Performance stats? How about 4.6 seconds to 60 and . . . wait, this thing tops out at 130 mph? And even then it’s electronically limited? That can’t be right. [Goes and checks.] [Goes and checks again.] Man, it is right! That’s pretty slow. Shoot, when I was in high school, the Smith brother’s mom had a station wagon that was faster than that. And I mean a lot faster. Okay, so dad Smith was a semi-pro drag racer and he dropped a 440 Wedge motor into the thing, but that Polara could fly, no two ways about it. But why get off onto a tangent, especially one of dubious legality? These new Mercedes-AMG models are on display at the 2017 Geneva Motor Show, and will be available for order this summer. 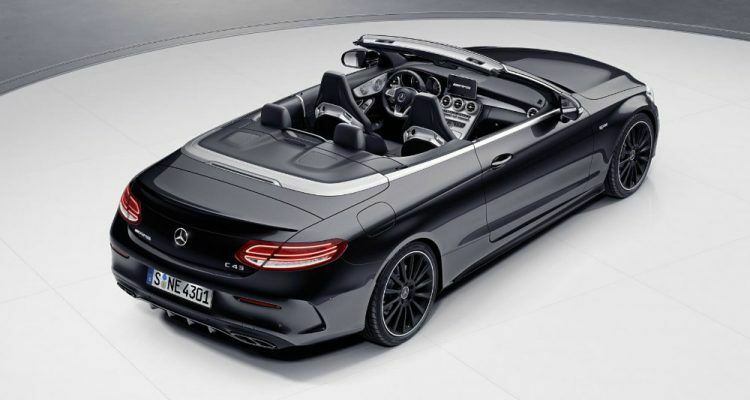 2018 Mercedes-AMG C43 Cabriolet with AMG Performance Studio. Photo: Mercedes-Benz USA. 1 Comment on "Mercedes-AMG Special Editions Arrive This Summer"